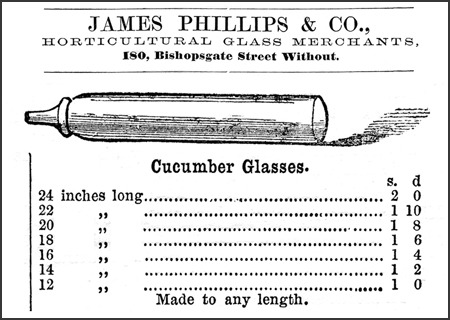 An advertisement for customizable cucumber glasses. In the mid-19th century, England was no country for crooked cucumbers. A curly, misshapen, or discolored specimen might be tossed to the pigs, who certainly wouldn’t mind. But by 1845, more perfect cucurbits were within reach. To straighten out a wayward cucumber, a 19th-century British gardener might have told you, you just needed to give it a little love. And maybe a giant glass straightjacket. 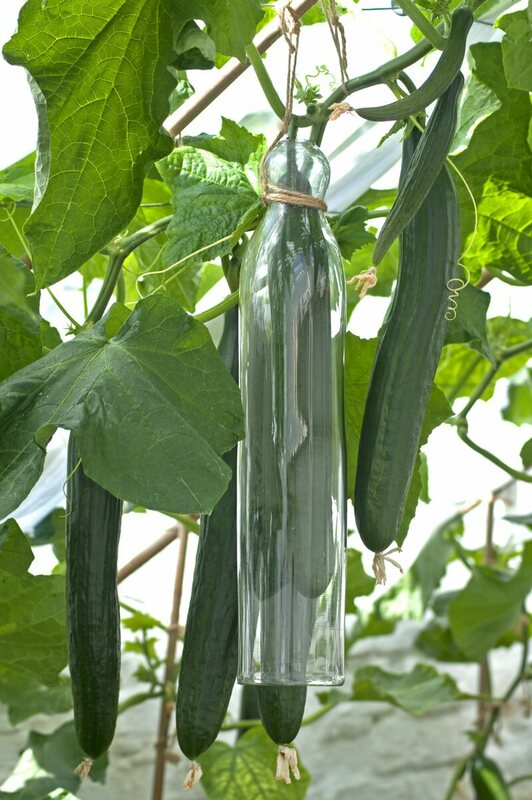 Long, tubular, and made of glass, the cucumber straightener is perhaps the most simple and superfluous gardening tool in history. But in the eyes of British gardeners, it rectified an intolerable perversity: a hooking, twisting cucumber. Long before England was obsessed with straight cucumbers, it was disgusted by them. The first cucumbers made their way to Great Britain in the 1300s, and inspired great disdain among the English that persisted for centuries. According to 18th-century British writer Samuel Johnson, it was commonly said among English physicians that a cucumber “should be well sliced, and dressed with pepper and vinegar, and then thrown out, as good for nothing.” The vine-growing fruit was even dubbed the “cowcumber,” suggesting the vegetable was so vile it only ought to touch the lips of livestock. It wasn’t until the iconic cucumber sandwich became popular among Queen Victoria’s family that the produce began to gain prestige. Subsequently, the delicate sandwich became an iconic teatime snack in British high society, and the cucumber, suddenly, was in vogue. To ensure the fruit could be slipped easily between slices of bread, it needed to be sliced thinly and evenly. Which called for a straighter cucumber. This might not seem like a big deal, but growing straight cukes is no simple task. Cucumbers begin to curve for a number of reasons, from humidity and temperature shifts to poor pollination. Some varieties of cucumbers curl easier than others, too. So unless gardeners really knew what they were doing, they’d likely end up tossing some of the harvest to the hogs. A cucumber straightener in action. For British engineer George Stephenson, however, leaving a cucumber’s fate up to chance wasn’t an option. A tinkerer from an early age, Stephenson spent most of his life working on the first British railway system. Best known for creating the “Rocket,” an early steam locomotive, and the first public inter-city line for locomotives, he became renowned as the “Father of the Railways.” But he was also a horticulturist at heart, and as his locomotive career wound down, Stephenson took the innovation and perseverance that helped him excel on the tracks into the garden.